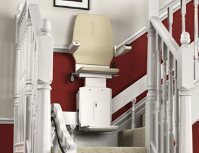 Whatever the stairs might be preventing you from accessing safely, the Acorn Superglide Straight Stairlift will give you the full use of the home you love. Acorn Stairlifts can be installed at a time to suit you, just tell us how soon you need it, and we will do the rest! The Acorn Stairlift will blend seamlessly into your home, and the smooth start and start allows you to glide effortlessly up and down the stairs without any worry. Having a hard time bending your knees? Is your stairway exceptionally narrow? As comfortable and reliable as the Acorn Superglide, the Acorn 80 curved stairlift is designed for more complex staircases. A Stairlift designed to withstand the elements....even in New England's extreme weather!